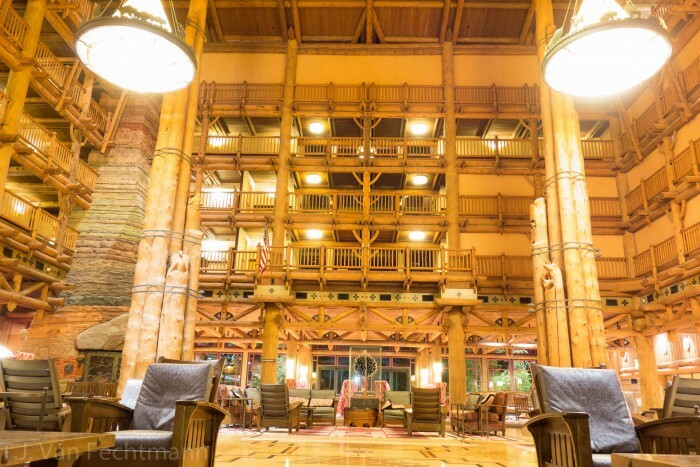 Wilderness Lodge is one of my favorite resorts in all of Walt Disney World. As a deluxe resort, though, I admittedly don’t get the chance to stay there as often as I’d like because of the prices. Luckily, with a lower than normal nightly rate due to the ongoing extensive resort renovations coupled with an annual pass discount, the decision to pull the trigger on a four night stay was that much easier. If you have an upcoming trip to Wilderness Lodge planned or are considering making a reservation before renovations are complete, you’re probably wondering if the construction will negatively impact your trip. I’m happy to report that construction was never a detriment to our trip and I’d happily stay there again in the resort’s current state. With that in mind, think of this article as a a resort review combined with a construction update. Upon arriving at the Wilderness Lodge late at night after heading directly to Hollywood Studios from the airport, I took a few minutes to enjoy the ambiance of the resort’s lobby, which is one of my favorites in all of Disney behind Contemporary and Animal Kingdom Lodge. Unbeknownst to me, the lobby was also in the midst of construction, which I wouldn’t have noticed if my fiancee, Sarah, didn’t point it out to me. Despite one entire side of the Wilderness Lodge lobby being boarded up on the upper levels, I clearly didn’t think it was that noticeable. See the picture above for yourself. For those of you that were “lucky” enough to see the Polynesian during its extensive transformation into the Polynesian Village Resort, you may remember that the entire middle portion of the lobby was boarded up on the upper level, which created an almost claustrophobic effect for anyone present. Thankfully, this is nowhere near as bad. 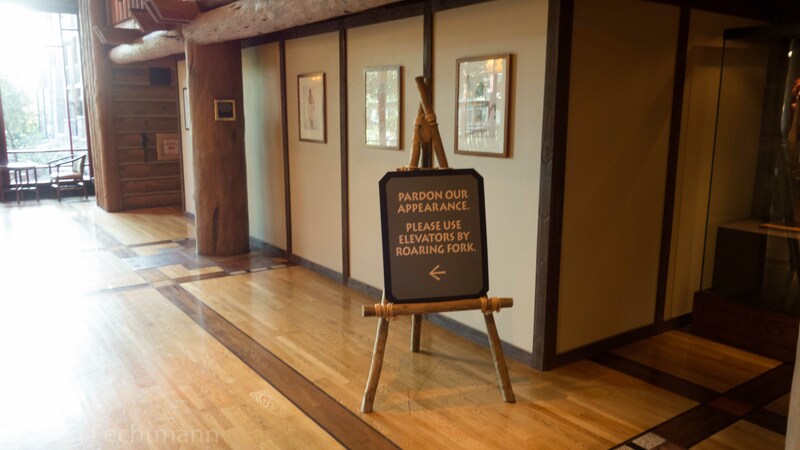 While I wouldn’t have recommended guests stay at Polynesian during the aforementioned renovations, I’m happy to say that the lobby at Wilderness Lodge doesn’t suffer from the same effect. Other than the boarded upper levels, the more significant victim of construction is that the main elevators in the lobby are down. While there are still elevators operating down the hallway past Roaring Forks, I can see how this could be an inconvenience to guests. As far as the actual room, the first thing I noticed was the wood carved headboard. I really like that Disney is implementing these across other resorts around the world, and I very much want to stay in Disneyland Hotel someday to see the headboard that actually lights up with fireworks. Other than the headboard, it was a fairly standard room as far as Disney goes: Two beds; small table and chairs; two bathroom sink. If you’ve stayed at a Disney resort before you know the setup. Mousekeeping was kind enough to leave us a small gift by providing us with three pins as a token of appreciation for staying while the resort is under construction. The offer was unnecessary but very kind nonetheless. I don’t want to say it’s worth staying here just for the pins but I remember how hooked I was on pins back in the day. We all have our demons. 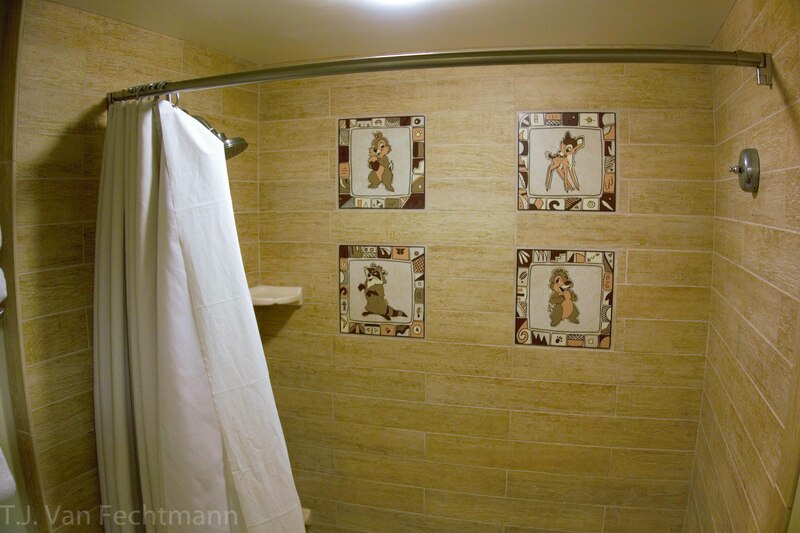 One other unique Wilderness Lodge touch that I liked was the tiling in the shower showing four woodland critters from Disney films. Speaking of showers, I did feel like the shower room (Disney bathrooms separate showers/toilets from sinks to maximize time for families to get ready) was fairly small with poor lighting. Again, nothing awful but worth noting. From our room, the only renovation impact we faced was that there was construction along the waterway between Seven Seas Lagoon and Lake Buena Vista outside of our balcony as seen below. I never heard anything noisy though. I even “tested” Disney’s statement that construction would only take place during the day by napping. I can happily report that I did not wake from my deep slumber. While some people may worry that the construction would be an eyesore, the views of the Contemporary and Tomorrowland off in the distance were more than enough of a distraction. With a standard room, you can have this view as well. I would recommend requesting a room on the upper levels to maximize your chances. Food and drink options are always important considerations for us when booking our Disney vacation. 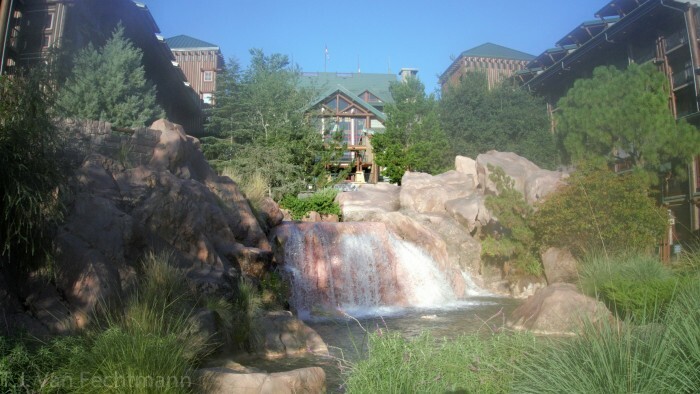 While we didn’t have a sit down meal on this trip, we did eat at Roaring Forks and drink at Territory Lounge and Trout Pass Pool Bar. Counter service dining at Disney World resorts is interesting to me because I feel like its the one aspect that’s better at value and moderate resorts than deluxe resorts. Having said that, Roaring Forks is probably one of the weaker deluxe counter service locations due to its small size and lack of dining options compared to something like Artist’s Palette or either of the options at the Port Orleans resorts. I understand that the demand for counter service is much higher at value resorts but I still think Roaring Forks could use one more food bay and better indoor seating that doesn’t feel like simply sitting in a wood box. The outdoor seating is a whole different story, however. Enjoying a quick breakfast outside at the Wilderness Lodge with the sun shining is a great way to start any day. On the drink side of things, I’d never had a drink at Territory Lounge before this trip but found it to be a relaxing experience. The lighting in the room is warm and the ceiling is covered with a large map showing the trail of Lewis and Clark’s expedition. One thing that Sarah noticed after we finished our drinks was that we couldn’t even hear anything from Whispering Canyon Cafe, which is just around the corner, while inside the lounge. As far as noise anomalies go, this is the equivalent of having a quiet meal right next to a Chuck E. Cheese. The Imagineers continue to impress. If day drinking is what you’re into, you’ll want to head outside to Trout Pass Pool Bar, which is located next to…the pool! I’m a big day drinking guy so I take this stuff seriously. The bar offered fruity vacation drinks and a welcome reprieve from the merciless July sun. There was construction visible to the right of the bar leading to the Villas but I didn’t find the noise or presence of a fence bothersome. If you really can’t help but notice the fence off to the right, pull a Derek Zoolander and finally make that left turn. Problem solved! 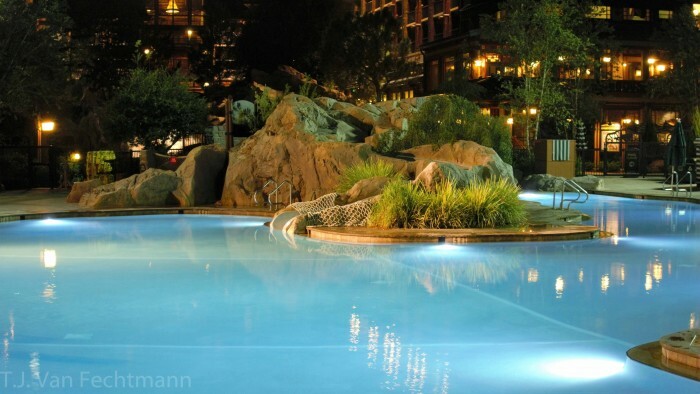 Normally, the Wilderness Lodge has two pools available to guests. There’s the larger Silver Creek Springs Pool (pictured above) and the quieter Hidden Springs Pool closer to the Villas. Unfortunately, the current construction means that Hidden Springs Pool is not available for guest use. 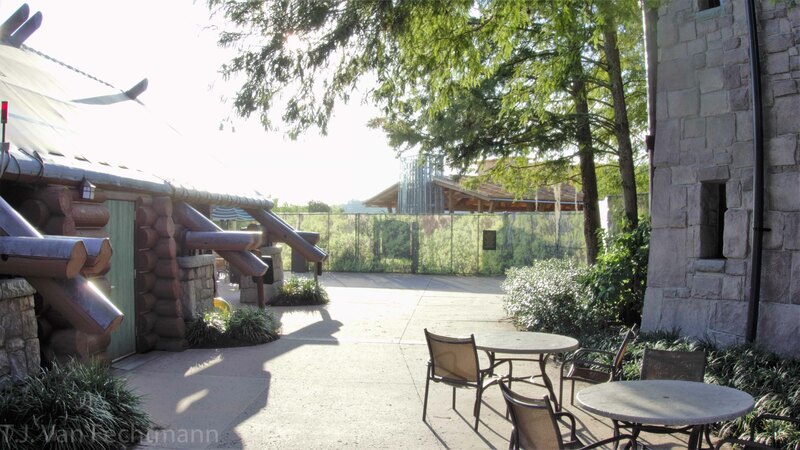 I loved swimming in the Silver Creek Springs Pool but I get that some parents would probably prefer a quieter getaway to relax at Hidden Springs Pool. One unique thing we saw was that cast members were actually checking to make sure that only guests were using the pool during our stay. I’m used to seeing this at Stormalong Bay over at Yacht & Beach Club but had never seen it at another resort. The cast member who was checking magic bands told me that they were only checking on weekends and was mainly to avoid capacity issues since there’s only one pool up and running at the time. If you’re a serial pool hopper, I’m sorry to report this news. Otherwise, if you’re a Wilderness Lodge guest, just bring your magic band and the cast member will scan it before giving you a wrist band to swim. We didn’t stay in the Villas so I can’t speak firsthand to what staying on that side of the resort would be like. Sarah did go over there to check it out and once again didn’t hear any construction. She even remarked that the Villa lobby wasn’t impacted at all either. If anybody in the comments can provide further insight into a recent Villas at the Wilderness Lodge stay, I’m sure our readers would appreciate it. As far as other resort amenities, we were able to utilize the running trail, resort buses, water taxis to Magic Kingdom and watch the majesty of the Fire Rock Geyser without being impeded by the construction. I even made a point to actively seek out construction photos one morning just to prove that I stayed there during the renovations. Basically, I think you’re only going to be really bothered by the construction if you nitpick everything. 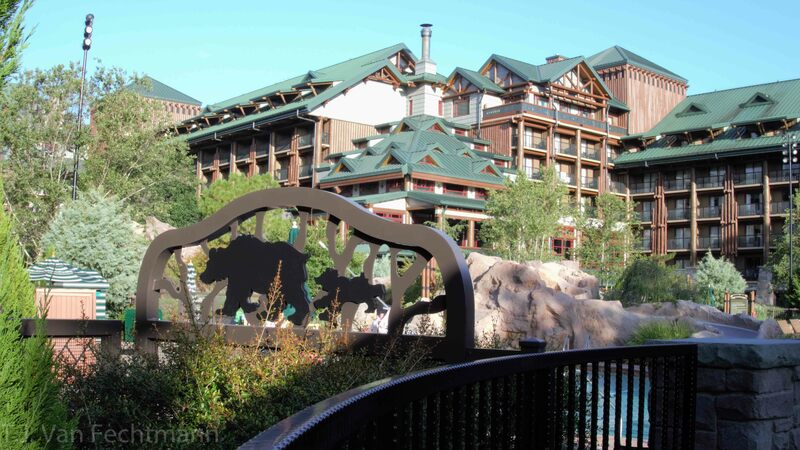 Wilderness Lodge is a wonderful Disney Resort that is made slightly less so by renovations that should make the resort even greater once they’re complete. So put away those “Make Wilderness Lodge Resort Great Again” hats. It’s great and I’m almost positive you’ll have an amazing stay there right now. Ever since his first trip before he could even walk, T.J. has loved Disney World more than any other vacation destination in the world. One of his goals in life is to visit every Disney theme park across the globe. Until then, you can find him making regular trips to Central Florida with the occasional trip to Disneyland as well. I stayed in the Villas last November during the demolition of the Hidden Springs Pool, and was unaffected by it. The workers clearly kept to the advertised work schedule, and I’m sure that assigning rooms on the side away from the work helped greatly. Our room faced towards the bus stop. I also thought the pins were a nice gesture. The Wilderness Lodge is my Disney Vacation Club home resort, and a long time favorite, so I am very sensitive to the goings-on there. I am happy to report that the efforts to insulate Guests from the work were very successful. 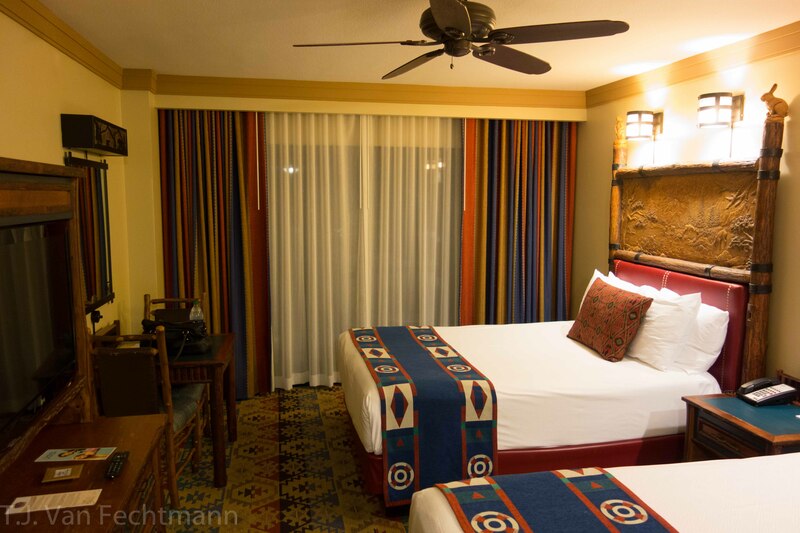 You know that the headboards in the Royal Guest Rooms in the Magnolia Bend section of Port Orleans Riverside have the optical effects kind of like the headboards you described at DL. Maybe until you get there you can visit POR and pretend! I’ll be staying in the villas in 12 days!! I’m looking forward to it (especially those pins)! Thanks for the report! 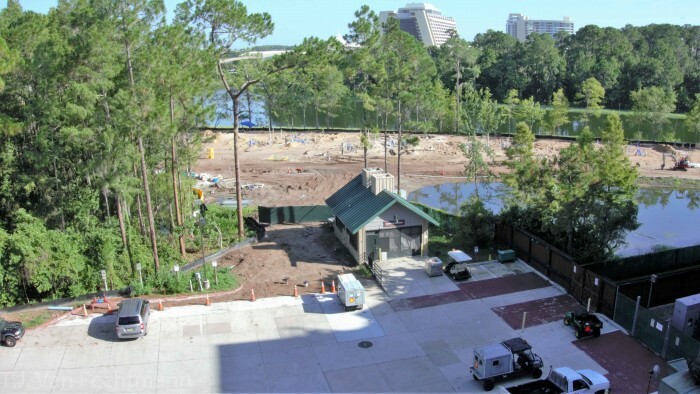 What’s going on between the resort and the lagoon where you can see the MK and the Contemporary?